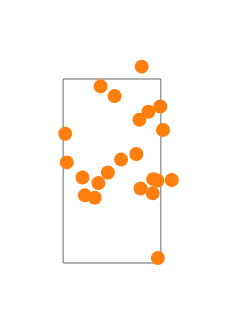 Jose Berrios vs. Corey Kluber had all the makings of an epic pitcher’s duel, but our guy had a ton of trouble finding the strike zone today. Berrios issued a career-high six bases on balls and lasted just four innings. Still, the Twins stormed back from a 4-0 deficit to tie the game in the sixth inning. The Bullpen locked things down until the Twins suffered yet another walk-off loss, their 12th of the season. 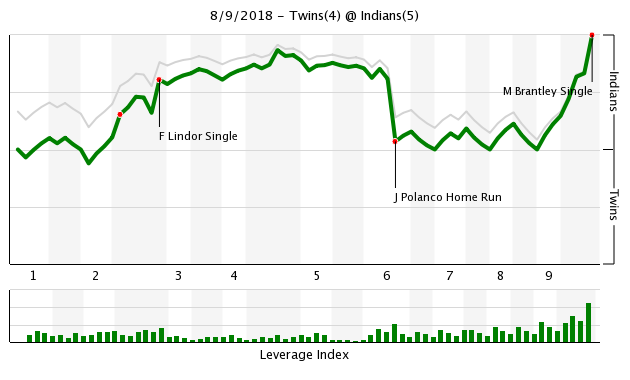 Jorge Polanco sure picked a good time to hit his first home run of the season. With the Twins trailing 4-1 in the sixth inning, Polanco pulled a 1-0 cutter out of the park for a game-tying tater. So we all know Kluber is already unreal on his own, right? Well it really makes things difficult when he’s fooling even the umpire. 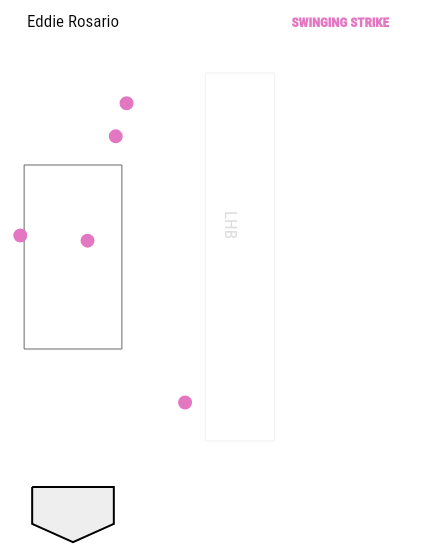 I try really hard to avoid mentioning balls and strikes in these recaps because I feel like things typically even out over the course of a game, but there’s no avoiding the impact home plate umpire Adrian Johnson had on today’s contest. Immediately after Polanco’s game-tying homer, it was as if a switch went off in Johnson’s head that he was going to start giving an extra couple inches to Cleveland’s ace. This game remained tied thanks to some strong performances from the Twins bullpen. Gabriel Moya threw 2 2/3 no-hit innings and was followed by a perfect inning of work from Taylor Rogers. Addison Reed came in and got the final out of the eighth inning and stayed in for the ninth. It didn’t go so well. Greg Allen hit a leadoff single, stole second base, advanced to third on a ground out and scored the winning run on a Michael Brantley single. Would Molitor ever get thrown out? Has he ever as a player or manager? Did Rowson break ranks? I'm bummed with losing, but nice to see the rally. Once again for the 12th time, the right puzzle pieces aren't present...or they aren't being put in the right places. Ultimately, though, come on Jose. This is just one game that doesn't matter anymore this season. 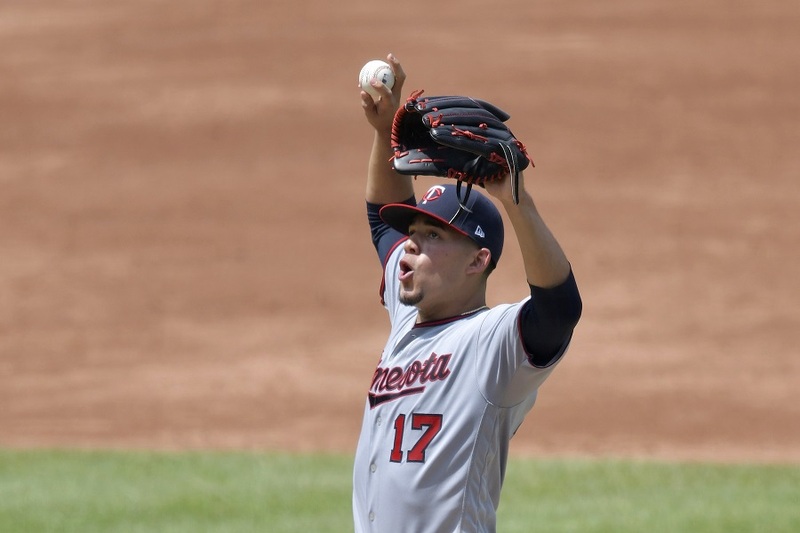 We need Berrios to be an Ace, among a few other things, of course. Otherwise, we can expect mediocrity to continue. OK, this has been updated with some of the usual bells and whistles. Would Molitor ever get thrown out? Has he ever as a player or manager? I remember him getting tossed as a bench coach under Gardy at one point. I think he threw a bat out into the field or something like that in frustration. And there was no fine after those comments. In other words, MLB acknowledged he was right. It was Fichter’s first year as a regular ump at the MLB level and I don’t think he lasted 5. He was one of the guys hired after the union’s strategy of mass resignation failed miserably. I keep looking for the real prospects in the system to show up, but I must have missed something on my travels - who is Field in LF?Where did he come from and when?